Anne made all the costumes for the whole of the Bishop's Men army. Anne is at the extreme left of the group. 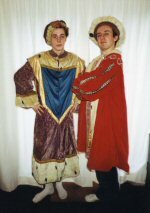 She started making costumes when she was a school girl at Grangefield Grammar School where she took on the responsibility of making and sewing all the costumes for a number of school plays. Each play had roughly twenty actors. All the costumes here were made by Anne. She is standing in the front row just to the right of centre. Adam Greatrix is kneeling on her right and Simon Greatrix is second from the extreme left of the group. 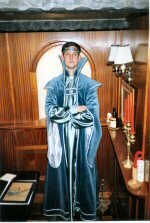 A costume made by Anne for David Wetherall. 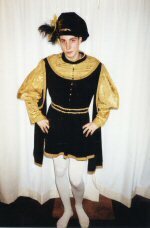 Another costume made by Anne. 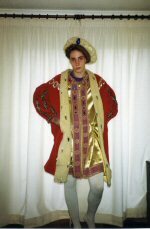 A costume made by Anne. 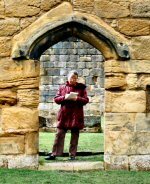 Anne preparing to look after the Monk's Garden at Mount Grace Priory. Anne preparing the feast for Moorland Treck. She is seen here in the Dairy at Fair Acre. A troll wondering how old he might be. 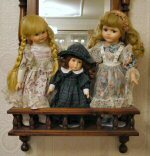 Three dolls dressed by Anne. Anne made many rag dolls. These are two examples. This is a sampler made by Anne. It measures 76 cm x 45 cm. It took her 25 years to complete. 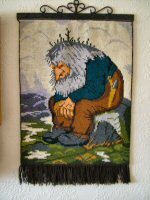 Every stitch had to be made under a magnifying glass and a magnifying glass is needed to see them. There are around 500000 stitches in this sampler. When Anne was within a few stitches of completing the top border at its right hand side she found that she was one stitch out. After several days searching, a mistake was found at the left hand end of the border. I suggested that no-one would ever notice the mistake but she said that she would know. All 10000 stitches in the top border were removed and the mistake corrected. Last modified on 1st of October 2008.